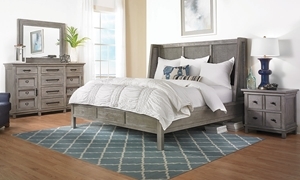 Ornate detailing on the headboard, chic upholstery and an antique gray finish give this twin-size bed an air of everyday opulence. King platform bed handcrafted from sustainably sourced solid mahogany, mango and white cedar, hand-finished using a 17-step process. Glamorous suite includes upholstered king storage bed, mirror and 9-drawer dresser, each flaunting stunning curves in a metallic finish. 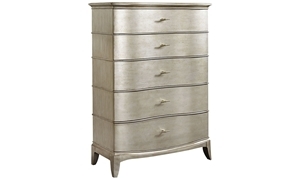 Serpentine Old Hollywood-style chest in a glazed metallic finish showcases five full-extension drawers, each topped with a chromed handle. Traditional suite in an alluring smoked molasses finish includes a stately king bed, 11-drawer dresser and matching landscape mirror. Massively scaled suite includes queen sleigh bed with tufted bonded leather headboard, marble top dresser and ornate beveled mirror. Massively scaled suite includes king sleigh bed with tufted bonded leather headboard, marble top dresser and ornate beveled mirror.